Automated pedestrian detection devices are able to sense when a pedestrian is waiting at a crosswalk and automatically send a signal to switch to a pedestrian WALK phase. Some automated pedestrian detection devices are also able to determine whether a pedestrian needs more time to cross the roadway and will lengthen the crossing interval to accommodate the slower pedestrian. Automated pedestrian detection devices reduce the percentage of pedestrians who cross roadways at inappropriate times, such as when the DON’T WALK signal is visible. There are generally two types of pedestrian detection technology: microwave and infrared. A delay can be built into either of the devices so that the Walk signal is called only if the pedestrian stays within the detection zone for a certain amount of time. The delay helps to prevent pedestrians who walk by the detection zone from accidentally activating the WALK signal. At certain pedestrian crossings, it is necessary for a pedestrian to push a button to receive a pedestrian WALK signal. However, studies have shown that many pedestrians ignore the button or believe that the button is malfunctioning if there is a significant delay in receiving a signal.18 Visually impaired pedestrians also might not know that it is necessary to push a button to cross the roadway. Automated pedestrian detection provides more timely pedestrian indications and ensures that pedestrians have enough time to safely cross the roadway. •	These types of crossings have been successfully used in Europe for many years. It is important to carefully consider where pedestrian signals for automated pedestrian detection devices are placed. The cost to install a pedestrian hybrid signal system is approximately $50,000 to $120,000, depending on site conditions and what equipment is already installed. Operation costs are approximately $4,000 per year. 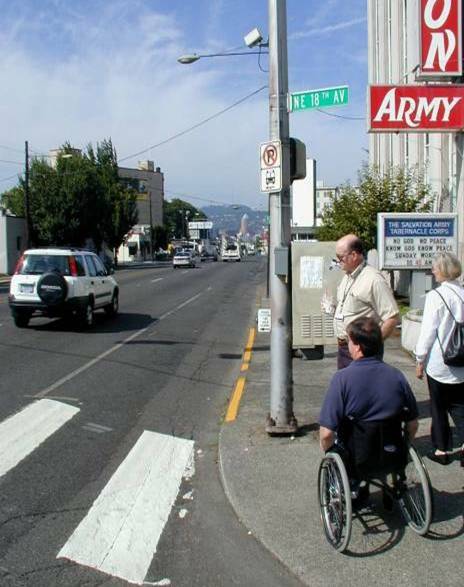 Adding automated detectors to an existing pedestrian signal can range from $10,000 to $70,000 per crosswalk. A summary of studies that have looked at the safety effects of devices using automated pedestrian detection can be found here.